Ok, as promised, I have written some tips for anyone who wants to travel with EDS or a different kind of chronic pain. This is obviously not an exhaustive list and some of may not be helpful to you, please feel free to share your own tips and tricks below. When I told people I was going to Cambodia, I got a lot of quizzical looks and “how the hell are you going to cope?”s. Some of it is bloody minded stubbornness but a lot of it is planning and preparing. Also, I know that the heat and adrenaline of the holiday will help a bit. Get insurance. Everyone should travel with health insurance but if you have a chronic pain condition it is essential. I use a UK company called Fish who are expensive but they are OK with me being broken. I can also declare all my conditions online without having to ring anyone. I’ve also used Age UK who are very similar to Fish (you don’t need to be a certain age to use them). Get a super lightweight bag which can be carried in lots of different ways – wheels, rucksac and waist/shoulder strap which you can hack on if needs be using climbing clip things and straps from other bags. My bag is an Osprey one which has wheels and a proper rucksack back complete with waist strap (this makes all the difference to me). It also has a day pack which zips onto the main bag and is all incredibly light weight. It also opens along the length unlike a rucksack where you open at the top so there is less rummaging around in your bag and accidentally dislocating your finger whilst you search for clean underwear. It was expensive but mine was half price in the sales and is well worth the investment. Make sure you have enough of your medication and pack it in your hand luggage. You might need a drs letter depending on where you’re going and what meds you’re on. Don’t change meds last minute – I did and it added to the stress! Again, depending on the country and your meds, you may need a license to enter. For Cambodia and Thailand, I needed documentation from the Thai and Cambodia government to take in morphine. Allow plenty of time for sorting this out before you go. The appropriate embassy is the best place to start for advice about this. Pack slowly over a few weeks. Don’t try and cram it all in in one day, slowly put yourself a list together and slowly tick things off as you add them. No point in starting a flare up before you’ve left the house. On a similar note, plan rest before your holiday. When I went to Cambodia, I set aside the two weekends before for rest and this made a huge difference to my pain and energy levels. Contact the airline to let them know about any food restrictions and ask for wheelchair support. This is amazing; you will get pushed from check in to plane then onto your next plane or to the taxi rank. It may feel embarrassing or you may be reluctant to ask for help but why waste your precious energy and walking ability to go round an airport, save it for going round the coliseum etc. Also having wheelchair assistance means you don’t have to carry your bag. My shoulders and hands hurt less because I was able to put my bag on my knee (which is heavy because it’s filled with meds). At the airport, once I reached my airline I had help with my bags, I bypassed the queues and they bought the wheelchair to me instead of asking me to walk back to the assistance people. Similarly you should contact the train station if you haven’t got anyone to help you get on and off the train. Having some visible sign of a disability seems to help as well… This year I was travelling with knee splints and a crutch (my other splints are mostly hidden) and I’ve had far more help. There have been idiots as well but the kindness of strangers has been great. I had people helping me to get my bags on and off the train, offering to put things in the overhead racks. The station staff let my friend through to help when I was struggling with my bag. Take a blanket and a pillow, it will vastly improve your flight. Yes long haul flights provide blankets, but they aren’t warm and they won’t help in the airports. A blanket can be used to make airport seats more comfy, less cold etc.. A blanket also helps hotel beds become a bit more comfortable – lay it under the sheet or use it as a pillow. If you’re travelling between places, use your blanket or bag as a footrest if you’re short, keeping feet and knees supported will help comfort and pain. Wear comfortable clothing to fly in, including shoes you can slip off easily so when you’re on a cramped plane, you can kick them off and push them under the seat. Take heatpacks, tubigrip, spare splints, whatever it is that helps a bit, it all adds up. Safety pins are very useful – things happen unexpectedly, splints break, clothes break and safety pins fix. Take a bear, some things will be tough and you’ll need a hand to get yourself up and going again. My tablet was really helpful. I loaded it up with tv programmes, audio books, kindle books (as well as taking my actual kindle), I wrote my holiday diary on, took the odd photo on it. If you need emergency info about something most places have WiFi somewhere. And on that note, take a kindle, do not, I repeat do not, waste precious spoons (not heard of the spoon theory? Check it out) on carrying books around. Readjust your expectations, you will not be able to go everywhere and do everything in your destination. Pick and choose carefully. One of my favourite days when I went to Bali was slowly walking to the art museum, slowly pottering around the beautiful gardens it was in, then coffee. Followed by lunch in a local cafe with a seat by the street so I could soak up the sense of the place and people watch. Then I headed back to the hotel via the market and had a nap whilst it rained outside. It was a lovely relaxed day and I did what I wanted to do on my schedule and made use of the weather so I didn’t feel like I was missing out. When I met up with the rest of my tour group, they had all got drenched in the downpour leaving them a bit miserable so I definitely got the best out of the day! You know your pace but I find it helps to go with realistic expectations. I know I can’t join in evening activities and daytime things so I choose day time because that’s more important to me. This does mean I had more room service food and less time with the rest of my tour group but at the end of the day, my limits are different to a lot of peoples and I can’t keep up. I have to choose what’s important to me. Don’t rush round doing everything as soon as you get there – you will crash. Instead, head to your hotel and relax, sleep, whatever for a while. The issue of toilets…. 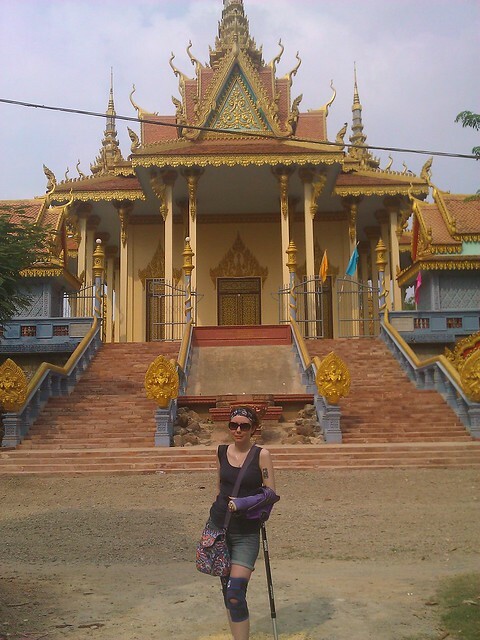 The time in Cambodia where I was wearing a long skirt, had my crutch, had awful leg pain and had the toilet was a hole in the ground… Ah that was a challenge! Depending where you go toilets may include squatting toilets or literally a hole in the ground, think about how you can cope. Postcards – if this is stressful or painful, don’t send them, or only send a few. You could email a photo instead. Don’t feel obliged to ruin your holiday to keep friends and relatives happy. I wore UV arm covers to put over my splints, bought from eBay. When I’m in the UK I wear cotton or wool arm warmers, partly to hide the splints and partly because the velcro sticks to everything and irritates me. If massages help. treat yourself, you’re on holiday after all! Plan time to rest after your holiday. If you work, book a few extra days off, you will benefit hugely from it. Again, I book out a couple of rest weekends after I’ve been on a long trip, or, if it’s a short trip, just the one weekend. If you’ve taken photos blow them up and put them near your bed or sofa so when pain gets you down you can look at them or frame a piece of art you picked up. Make sure there are reminders of the trip. Final words of advice… enjoy yourself! This entry was posted in Ehlers Danlos Syndrome and tagged chronic illness, chronic pain, eds, ehlers danlos, ehlers danlos syndrome, hms, hypermobility syndrome, pain, physical health, physical pain,travel, travelling on April 11, 2015. Fibromyalgia versus Myofascial Pain Syndrome (Part 2) – What Can I do About It? Now that you know the difference between fibromyalgia and myofascial pain syndrome, and maybe you’re suspecting that you have one or the other or both, you are probably asking yourself “What next?” How are they treated? So as you can imagine, treating fibromyalgia is very different from treating myofascial pain. We honestly don’t understand much about fibromyalgia, although advances are being made every year. In my experience there are a variety of causes and types of fibro, so I tackle each case based on what seems to be causing it. Many times I’ll discover along the way that a patient doesn’t really have fibro at all, and instead has hypothyroidism, or chronic muscle pain and fatigue from perimenopause, or hypermobility syndrome causing constant strain on tendons/ligaments/connective tissue, or sleep apnea that causes fibro symptoms from years of poor sleep quality. If none of these are the case, and a patient really has fibromyalgia and no obvious other cause for their symptoms, then the general consensus is to address sleep, maximize serotonin levels in the brain, and find ways to “turn down the volume” of the overactive nervous system. This can be accomplished by various medications, supplements, exercise, acupuncture/Chinese herbs, electrotherapies/laser therapies, massage, etc. I am able to do many of these treatments in my medical practice, and I refer out for the ones I’m not trained in (acupuncture for example.) There are a lot of scams out there aimed at desperate fibro patients, so I am very cautious when it comes to new or unproven treatments, especially if they cost a lot of money. Keeping that caution in mind, however, I do believe if something has been proven to be safe and is relatively inexpensive it’s certainly worth a try if there’s a chance it could help! Treating myofascial pain is much simpler in theory. It is usually just a matter of disrupting the trigger points/muscle knots, and stretching them out to prevent their return. Trigger points can be disrupted mechanically using massage or acupuncture or electrotherapies, or chemically using oral or topical or injected medications, and providers frequently use a variety of these methods. The tricky part is if the trigger points have been there for many years, or if there is a severe anatomical or other issue that tends to encourage them to return quickly. For example, some patients with hypermobility syndrome continually develop new trigger points and releasing them is a lifelong project, which can seem overwhelming at times. But most people can learn to treat their own trigger points using self massage tools, so they only need to seek professional help periodically. Hopefully this series of articles helped to clarify the basic differences between fibromyalgia and chronic myofascial pain syndrome, and gave you some ideas about the treatment options available for both conditions. Please leave comments or questions below, and check out the following links for more useful info on both conditions. This dog wants to interview you!